Time, as it often tends to do, has flown. I can't believe it, but today marks three years since I became an uncle. Happy Birthday, Matthew! Love you, butthead. 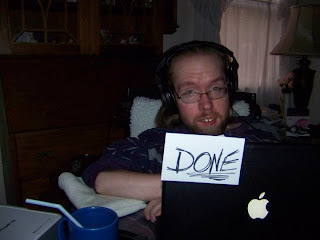 Well, since my last blog entry, I've been busy. Very busy. I suppose the biggest news would be that after 7 months of working like crazy, I've finally finished animation for Four Tanks and a Healer. Completion was reached in the early hours of November 13th. I was exhausted, but so relieved. Uploaded by JacobDrake. - Full seasons and entire episodes online. I hope people will like the finished product once it's released. It was a long road of many many late nights spent sitting by myself in the dark and animating. I won't lie, it was rough. My sanity was frequently saved by watching The Nostalgia Critic and more recently, old clips of The Kids in the Hall on YouTube. I had forgotten how great that show was, I really need to get myself the complete series on DVD soon. Since finishing my work on Four Tanks, I've spent this last week living a fairly hobbitish lifestyle- eating, drinking, relaxing, and enjoying my sleep more than I have in quite a while. It's nice. It actually took me a couple days to get over feeling guilty for relaxing instead of working, but I'm good now. So, now that that's done, what's next? Well, after I decompress a bit more, my top priority is to dive in and finally finish The Girl and the Ghost once and for all. After that, I've got a few potentially amazing projects in the works, but we'll discuss those once they're a little closer to fruition. Now I've got more time to blog and I've got tales going back to March waiting to be written about, so it'll be nice to sit down and tackle those. For now, I'm just looking forward to enjoying Thanksgiving week, hanging out with friends, and just being.